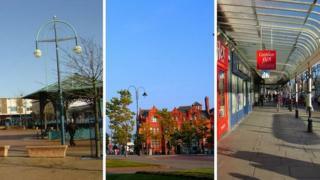 A new £5m fund to revitalise town centres in the Liverpool City Region has between announced. Metropolitan mayor Steve Rotheram said he would allocate £1m to each of the combined authority's five councils. The money could be used to support independent businesses, restore shop fronts and public spaces. Mr Rotheram said the money would be delivered via a new City Region Town Centre Commission, which would release the "untapped potential" of towns across the region. Towns which could benefit include Birkenhead, Southport, St Helens, Runcorn, Widnes, Kirkby, Prescot and Bootle. From Runcorn to Bootle, each of the city region's boroughs has at least one town centre which is struggling. With retail giants like Marks and Spencer and House of Fraser soon departing, Birkenhead would surely have a claim to some of this cash. Wirral Council and local Mp Frank Field have an action plan to get the town back on it's feet, but that would require millions rather than the thousands of pounds worth of investment this pot can provide. Retailers in Southport recently told me after hours entertainment, free parking and lower rents would give them a boost - not all things the mayor's fund can help with. While Liverpool was "the economic engine of the region", Mr Rotheram said politicians "must also ensure that every part of our region thrives." He added: "This is a clear signal that I will ensure that the benefits of devolution really are passed on to every part of our city region." The new commission will work closely with the combined authority to agree which towns to fund.